If the travel plans include stops at hotels or restaurants, there's no reason to leave Fido behind. 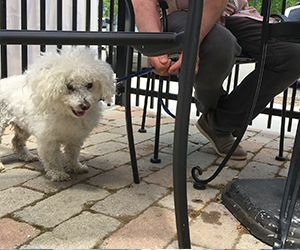 Many eateries now have patios, decks and rooftops where four-footed patrons can dine with their human companions. More hotels, too, are accepting canine visitors, as long as the dogs are well behaved and pet parents follow certain guidelines. 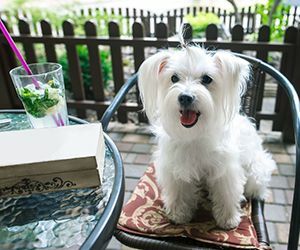 All it takes is a little pre-planning and some basic rules of pet-iquette to make your pup a welcome guest at these establishments. 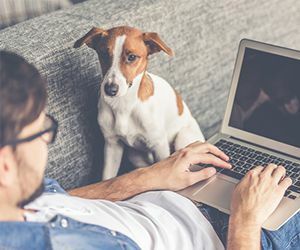 Be sure to contact any establishment you plan to visit beforehand to make sure they still accept pets and find out if they have any special policies regarding furry guests, such as an additional fee or size limitation. Whether taking a dog to a restaurant or hotel, the location you choose within the site can be important in making things go smoothly. When booking a hotel, pet parents should request a room on the first floor, ideally one with a doorwall or other direct outdoor access, since this will be more convenient for potty walks. At a restaurant or café, try to get a table in a corner or secluded area away from the main traffic flow so that the dog can stretch out and not get in the way of staff and customers. Just like humans, dogs should be able to relax and enjoy their stay in a hotel room. This is a strange environment, so bringing along familiar blankets, pillows and toys from home will help create a secure, cozy haven. 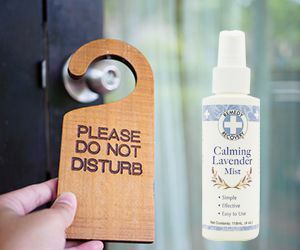 A relaxing aura can also be achieved by spraying the room with an aromatherapy calming mist, such as Cardinal's new Remedy+Recovery Calming Lavender Mist, formulated especially for dogs -- Learn more. Be sure to use the "Do Not Disturb Sign" to prevent the hotel staff from startling pets by knocking on the door or entering the room. 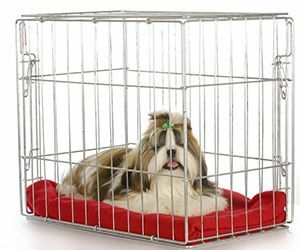 Many dogs will feel more secure in a crate when their parents leave the hotel room. If you do decide to use a crate, the dog should be made familiar and comfortable with it before the trip. Put favorite blankets in the crate, and keep the dog busy and happy while you're gone by including a chew toy or puzzle stuffed with delicious treats - we recommend our Pet Botanics Grain-Free Mini Duck With Bacon Flavor Training Rewards. When dining out with your pup, feed her a hearty meal first -- she'll be less likely to go crazy over the food aromas at the restaurant if her stomach is full. Tiring her out with exercise beforehand is also a good idea. Bring along a chew toy or puzzle to keep your dog occupied while you eat. Also bring a water bowl and plenty of your dog's own treats to reward her for good behavior - and make the alfresco dining experience fun for your furry friend too.